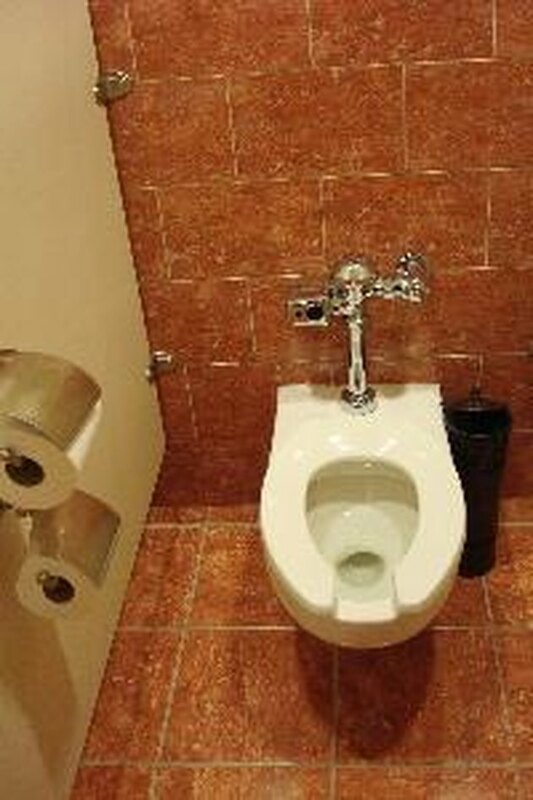 There are two basic types of toilet seats: The open-front seat, which resembles a horseshoe, often has no lid and is used frequently in public bathrooms. The closed-front seat, which is a closed oval shape, usually has a lid and is almost exclusively used in home bathrooms. A basic open-front toilet seat is less expensive than a closed-front seat, for several reasons. Open-front seats use less material, not just by omitting the space in the front, but also by generally being thinner than their closed-front counterparts. Open front seats usually -- though not always -- come without a lid. Closed-front seats are generally thicker and lidded, and they also come in a variety of colors to match a bathroom's decor, while open-front seats are usually made in basic white or black. In some cases, specialized open-front seats, such as medical or extra-large toilet seats, are more expensive than basic closed-front seats. An open-front seat has an institutional appearance and, because there is usually no lid, allows you to see into the bowl. Since open-front seats are often placed in closed bathroom stalls, their appearance doesn't need to be fancy. A closed-front seat looks more like a chair when the lid is down, and it comes in a variety of colors and styles. Most homeowners decorate their bathrooms to be visually appealing, and the closed front seat fits with that. Open-front seats are often considered more sanitary, though it has less to do with the front of the toilet seat being especially unhygenic, and more to do with the fact that there's just less to clean on an open-front toilet seat. Closed-front toilet seats generally have more parts and surfaces to clean, but there is usually only one to clean in a home bathroom compared to several in a public bathroom. Home toilet seats are used much less often and are shared by significantly fewer people. The main reason public restrooms have open-front toilet seats is because of the Uniform Plumbing Code, section 409.2.2, which says that all toilets seats, with the exception of those in private homes, must have open fronts. This code is commonly upheld in most parts of the U.S., so that's why you rarely see a home-style closed-front seat in public. While there is nothing saying that home bathrooms should use a closed-front seat, and most home suppliers offer open-front styles, the closed-front style remains standard for household toilets.